British watchmaker Christopher Ward developed the first automatic collection of their models for the beautiful half of the planet. Design innovations Belisama W90 and W900 are created in honor of iconic watches Cartier «Tank», as well as the Celtic goddess whose name and named the collection. Before and after the collapse of the Roman Empire, the British and the Gauls worshiped Belisama. Goddess associated with the craft and wisdom and light. 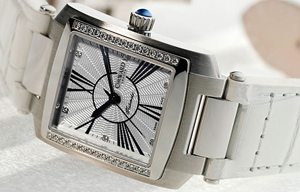 Goddess symbolizes silver rays on the dial, and the sparkle of diamonds. Housing a size of 36 x 25,4 mm, made of polished stainless steel or steel coated with 18-carat gold. Decorated in the form of sunlight silver dial equipped with Roman numerals, three arrows to indicate the hours, minutes and seconds. Crowns, located in the “3:00”, decorated with cabochon blue. Model W900, which price is 1150 £, has a bezel adorned with diamonds on the sides. The version W90, you can buy for 599 £, there are only six of diamonds, which are inserted in place of hour markers. Models come in different strap or stainless steel bracelet. New items from the collection have Belisama Swiss ETA 2671-2 automatic movement with 38 hour power reserve.